When someone has been injured in an accident, we often hear the words “pain and suffering” when referring to the damages in a personal injury lawsuit. But what exactly does that mean? If you have suffered an injury due to another person’s negligence, what type of compensation are you eligible to receive as a result? Let’s take a look. In personal injury cases, “pain and suffering” refers both to the physical pain and suffering as well as the mental pain and suffering. Physical pain and suffering refers to the pain and discomfort experienced by the victim as a result of the physical injuries sustained. This includes any pain and suffering that has already been endured, as well as any adverse effects that the victim is likely to experience in the future as a consequence of the injury. Mental pain and suffering is a consequence of the physical injuries sustained, and is a result of enduring the physical pain and trauma of the accident. Mental pain and suffering may include a broad range of negative emotions such as anxiety, anger, fear, mental anguish, loss of enjoyment of life, emotional distress, and humiliation. More severe mental pain and suffering may include depression, mood swings, diminished appetite, reduced energy, and post-traumatic stress disorder (PTSD). As with physical pain and suffering, mental pain and suffering includes the side effects that have been endured by the victim thus far, as well as the mental pain and suffering that they are likely to experience in the future. Every personal injury case is unique due to the variety of circumstances surrounding each accident as well as the different types of injuries sustained as a consequence. There is no one formula for evaluating the pain and suffering endured by the victim. Instead, consideration is given to the range of effects the accident had on the victim. For example, an individual who suffers an accident that results in serious injuries may then become depressed and have difficulty sleeping. The victim must endure physical pain and suffering from the injuries as well as undergo psychiatric counseling to address the mental suffering. The victim may not effectively recover from the mental anguish, resulting in an inability to return at work. Now the victim has lost their livelihood, has suffered financially, and may also suffer from isolation and humiliation as a result. All of these effects are an outgrowth of the accident and the victim may be compensated for them in a personal injury case. If you or a loved one has experienced an accident due to another person’s negligence, you may be entitled to receive compensation for your pain and suffering. 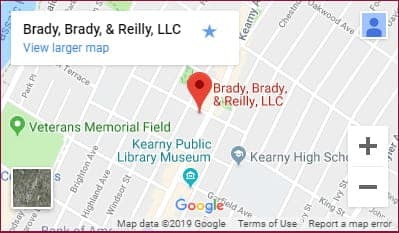 The experienced Kearny accident lawyers at Brady, Brady & Reilly, LLC have helped New Jersey families receive the compensation they deserve for more than 50 years. Contact a member of our team today at 201-997-0030 or contact us online to schedule a confidential consultation.